The Dutch research investigating the violence during the Indonesian war of independence is still causing controversy. Especially the violent Bersiap period will get a lot of attention. A historian from the University of Indonesia (UI) is refusing to cooperate with the research initiated by three Dutch institutions. The study, titled “Decolonization, violence, and war in Indonesia, 1945-1950,” has a budget of 4.1 million euro. The research was started September, 2017. He previously had a pioneering role in the Ermelo Foundation with veterans from the Siliwangi Division. Their purpose was to make contact with Dutch veterans who had been fighting in Indonesia as enemies of the Siliwangi army. With this foundation, which was established in 1996, 50 Siliwangi veterans were approached, on the invitation of Dutch veterans, to meet each other. The relationship between the two groups of veterans was improved by seeing each other as former “brothers in arms”. Then it’s counter-productive to revive an old conflict. “Forgive but don’t forget, the problems are perhaps behind us but we shall never forget”, says Rushdy. But there’s more to Rushdy’s refusal. One of his concerns is the influence the research would have on Indonesian historiography regarding the war of independence, which can be assumed to hold some truth. The Indonesian image of this history could be re-shaped by the Dutch research. The Netherlands is a country which has ample historical documentation. That will be their most important weapon the moment they are in contact with Indonesian researchers. by staying stuck in historical wounds, Rushdy fears that the Indonesian historiography will be changed. 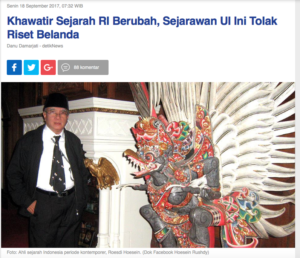 Indonesia has less documentation to support its own historical narrative. On the other hand, it’s worth noting that the (former) Dutch Minister of Foreign Affairs, Ben Bot, by his presence at the independence celebration in 2005, accepted that Indonesia’s independence was indeed August 17, 1945. But getting back to Rushdy, he feels that the Dutch and Indonesians have a love-hate relationship. Each has these contradictory moments in their history books. If the decolonization process is brought to light by Dutch researchers, the results could easily deviate. Apart from the independence date, the Netherlands will also be interested in the Round Table Conference (RTC), the agreement signed by Mohammed Hatta on November 2, 1949. “According to the Dutch, Indonesia was uncooperative by unilaterally breaking the negotiations of the Round Table Conference and to claim authority over the West Papua issue. During the RTC, Papua was not designated as belonging to Indonesia,” he explains. In reaction to the Papua conflict Indonesia took over all Dutch assets and nationalized all the Dutch businesses. This will, of course, be the next step if the Dutch research is successful. The three Dutch research institutes that are involved are the Royal Netherlands Institute of Southeast Asian and Caribbean Studies (KITLV), from the University of Leiden, the Institute for War, Holocaust and Genocide Studies (NIOD) and the Netherlands Institute for Military History (NIMH). The research investigating the decolonization is inseparable from the works by Remy Limpach (The Burning Villages of General Spoor) and Gert Oostindie (Soldier in Indonesia). The researchers will investigate whether the historical claims made by these studies are valid. “Sing wis yo wis (lay to rest that which has past),” says Rushdy.